7.53 points at 32 votes (rank 190). The Kung-Fu master Thomas strolls through town with his girlfriend Sylvia. Suddenly, the two are attacked by several figures. While Thomas is distracted, Sylvia gets kidnapped. Thomas later finds a message from Mr. X, the owner of the Devil's Tempel. The message reads: "We have your lovely girlfriend Sylvia. If you want to save her life, come straight to the Devil's Temple. The five sons of the Devil will then attend to you." The Temple consists of 5 hallways (levels), that have to be done in a certain amount of time (each 2000 points). Furthermore do Thomas and his opponents have life energy. Thomas' energy is also not allowed to reach zero, or else you need to repeat the level. All items and creatures that are only touched feed upon this energy. While dwarfs and henchmen, items and animals do have only little life energy, the knife thrower, however, needs to be hit twice. The end bosses have as much life energy as Tom. There are only points for fended off end bosses during an attack. Level 1 (from left to right): You need to fend off henchmen and knife throwers that attack Thomas from the front and back, before you reach the end boss. Level 2 (from right to left): Here is more action, which is in the 1st part that vases and balls fall from the top, that contain surprises as snakes and fire-breathing dragons. Also balls appear from above which explode into several parts after some time. Either destroy them right away or avoid them correspondingly. In the second part you meet again the henchmen and knife throwers, as well as skilled dwarves that can do acrobatic jumps. Level 3 & 5 (from left to right): As in level 1, with additional dwarves. Level 4 (from right to left): Here, at first killer bees appear which Tom should avoid. When the killer bees attack, they have to be destroyed. Then again the enemies as in level 3. Level 6: When all 5 hallways were successfully done, the game starts again from level 1. The difference is that dwarves are in it now and the number of enemies is higher. This is also valid for the following levels. Level 1: Stick fighter who hits with his stick either up or down. If Thomas gets very close to him, he cannot get hit (easy enemy). Level 2: Bumerang thrower that throws top or bottom (a bit more difficult enemy). Level 3: Giant that boxes or kicks (easy enemy). Level 4: Wizard that gets invisible, changes the side, works with reflections or throws fire balls, snakes, bats and dragons (rather difficult). Level 5: Mr. X, very intelligent and enduring, left behind him is Sylvia tied to the chair. A horizontally scrolling game with multicoloured graphics, simple but catchy background music full of suspense and simple sound effects for the kicks, received and given blows, sounds of the animals and items. The game offers altogether 5 levels, in which each one end boss needs to be defeated at the end. The screen is divided into 3 areas. In the menu you can set the number of players (one / two player mode), starting level (1 to 5) and review mode with the keys RETURN , SPACE , as well as 1 to 5 . After reaching the stairs at the end of the level or respectively the hallway the rest of the energy and time are added as further points to the score. Every 40.000 points you get an extra life. To play the game fast and successfully, always go on walking determinedly. Fight the enemies only directly before an attack. In any case avoid the "headlock" situation, as it is very energy-sapping and time-consuming. Sometimes it is wise to avoid items by jumping or ducking, especially in levels 2 and 4. And the right distance to the enemies is very important, especially if you are fighting while being too close, the kicks have no effect. With the key combination Shift +G you can use a fire arm in level 1. 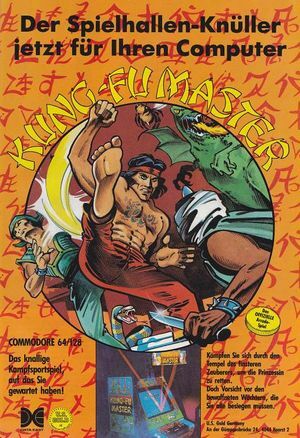 Werner: "One of the best scrolling Beat'em Ups for the C64." Jodigi: "The arcade machine version was a bit more difficult here, although the conversion was done 1:1. Maybe at home you do not play under so much stress as at the arcade machine. 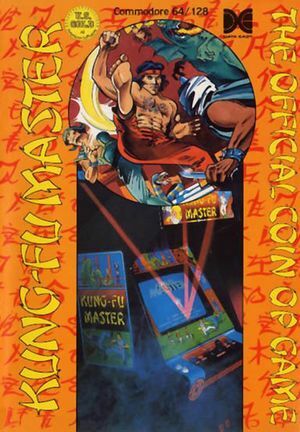 However, it is a great karate game which sometimes can enthuse me for hours." Spaceball: "An absolute action hit. Very awesome game. Although it is rather monotonuous on the long run." govi: "Brilliant game, a classic!" Rockford: "I cannot quite comprehend the elation. Loveless graphics, stupid enemies and bosses, which can be beaten practically in passing them and while hammering on the button in the first four levels, to then be an almost insurmountable obstacle. An ′Ugh!′ from me for the trick to force the player to switch between kicks and blows with ′Space′! 5 points from me." Shmendric: "I have to agree partially with Rockford, the difficulty grade of the game is (as far as I remember) adjustable but with a bit of practice and a good joystick you can walk through the game comfortably. However, it was fun, it is just the 'addictive quality' that is missing." The game is loosely based on the movie "Game of Death", which is also known by other titles. Bruce Lee plays the leading part and, towards the end of the movie, works his way through the storeys of a pagoda, in which he has to fight amongst others against a stick fighter and a giant. Many of these fighting scenes were thought to be lost footage and were only published years later in the documentation "Bruce Lee: A Warrior's Journey". 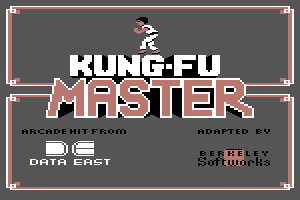 Kung-Fu Master in the Killer List Of Videogames. This page was last modified on 2 March 2019, at 20:48.